Our most advanced candidate drug for CF, potentiator GLPG1837, was the first potentiator since Kalydeco to show comparable results in G551D patients in the SAPHIRA 1 Phase 2a trial in late 2016. SAPHIRA 1 was an open-label study of three doses of GLPG1837 in 26 patients with the G551D mutation. 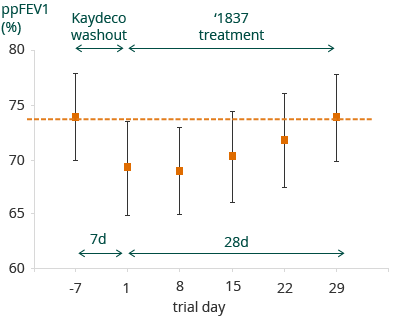 Of these patients, 25 patients were on stable Kalydeco treatment at screening and agreed to a one week washout prior to the start of dosing GLPG1837. One patient was naïve to Kalydeco. All subjects received GLPG1837 125 mg bid (twice-daily) for 7 days, immediately followed by 250 mg bid for 7 days and subsequently by 500 mg bid for 14 days. All ‘1837 exposure measurements are taken pre-dose escalation, except for days 22 and 29 in which there is no escalation. Here ‘1837 concentration measurements are taken prior to intake of first daily dosis. Overall GLPG1837 was well tolerated in SAPHIRA 1, with observed treatment emergent adverse events being predominantly mild or moderate, and typical for a CF patient population. One patient dropped out of the study due to an increase in non-cardiac creatine phosphokinase. We believe that SAPHIRA 1 represents a clinical validation of our in vitro systems, reinforcing our confidence in our approach to get to a triple combination therapy. We initiated a Phase 1 trial for a second potentiator candidate GLPG2451 in May 2016. Follow-on potentiator GLPG3067 is currently in Phase 1. 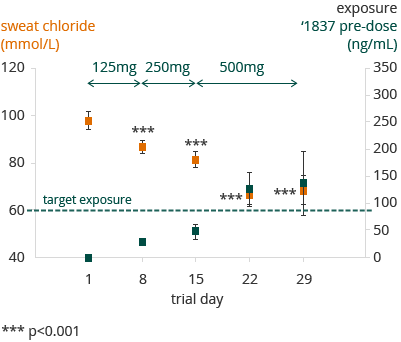 GLPG1837 has a twice-daily dosing profile, while GLPG2451 has potential for once-daily dosing. We reported that GLPG2222, the first early binding (C1) corrector, showed favorable safety and tolerability in Phase 1 trials in healthy volunteers in June 2016. GLPG2222 was tested in single ascending doses up to 800 mg, and in multiple ascending doses up to 600 mg qd for 14 days in a double-blind, randomized, placebo-controlled study. The candidate drug was shown to be well-tolerated and no emerging safety signals observed in the dose range studied. Absorption of GLPG2222 was rapid and favorable. Pharmacokinetics of GLPG2222 support once-daily dosing regimens to be explored in further development. We believe GLPG2222 is well positioned for selection for the first triple combination therapy in 2017 and will be further explored in the clinic throughout the year to improve our understanding of dosing for the triple combination, including a Phase 2 trial on top of Kalydeco in Class III mutation patients initiated in January 2017. We dosed the first healthy volunteer with a combination of GLPG2451 and GLPG2222 in February 2017. Follow-on C1 corrector GLPG2851 will enter Phase 1 trials in 2017. We initiated a Phase 1 trial for our first late binding (C2) corrector GLPG2737, the final component needed for a triple combination therapy, in November 2016. Topline results from this trial are expected in Q2 2017. We are developing follow-on C2 correctors which are expected to enter Phase 1 in 2017.